Venus possesses a dense, hot atmosphere, primarily of carbon dioxide, with a pressure of 93 bars and a globally uniform temperature of 740 K at the surface. The surface is totally hidden at visible wavelengths by a cloud deck(really a deep haze) of concentrated sulfuric acid droplets that extends from 50 km altitude to a poorly defined top at 65 km. The clouds are thus located in the top part of the troposphere, which extends from 0 to 65 km. The middle atmosphere (stratosphere and mesosphere) extends from 65 to about 95 km, and the upper atmosphere (thermosphere and exosphere) from 95 km up. Although the rotation period of the solid planet is 243 Earth days (sidereal), the atmosphere in the cloud region rotates in about 4 days, and the upper atmosphere in about 6 days, all in the same retrograde direction. The study of Venus by Earth-based telescopes has been frustrated by the complete cloud cover. The presence of CO2 was established in 1932, as soon as infrared-sensitive photographic plates could be applied to the problem. But establishment of the abundance was impossible because there was no way to determine the path length of the light as it scattered among the cloud particles. Moreover, it was assumed that nitrogen would also be abundant, as it is on Earth, and this gas cannot be detected in the spectral range available from the ground. Careful observation of the feeble patterns detectable in blue and near-ultraviolet images was able to establish the presence of the 4-day rotation at the cloud tops. Radio astronomers, observing Venus’s emission at the microwave wavelength of 3.15 cm, discovered in 1958 that it appears to be much hotter than expected, and this was confirmed by later results at other wavelengths. The most likely suggested explanation was that the radiation came from a hot surface, warmed by an extreme version of the greenhouse effect; but the required warming is so extreme that other hypotheses were debated. Spacecraft measurements, as will be described, finally settled the issue in favor of the greenhouse effect and showed that the pressure at the mean surface is 93 bars. A large number of spacecraft experiments on 22 missions have been devoted to study of the atmosphere; along with that of Mars, it is better explored than that of any planet other than the Earth. United States missions, starting in 1962, were the flybys Mariner 2, 5, and 10 (which went on to Mercury); Pioneer Venus Multiprobe and Orbiter in 1978; the radar mapper Magellan; and the Jupiter-bound Galileo. Successful Soviet ones were Venera 4–14, which included entry and descent probes as well as flybys or orbiters, from the microwave radio measurements. The composition of the clouds was another important question, but it was actually answered first from analysis of ground-based observations of the polarization of light reflected from the planet. Although such measurements were first made in the 1930s, the computers and programs to carry out the analysis did not exist until the middle 1970s. This analysis pinned down the refractive index and showed that the particles are spherical; these two properties eventually led to the identification of supercooled droplets of concentrated sulfuric acid (H2SO4). Measurements from the Pioneer Venus probes confirmed this composition and gave much greater detail on the sizes and layering of the haze. Three principal techniques can be applied from Earth: spectroscopy, radiometry, and imaging. They can be used over a wide variety of wavelengths, from the ultraviolet to the shortest part of the radio spectrum. Spectroscopy, as mentioned earlier, was first applied in 1932 and led to the discovery of CO2. Little more was done until the middle 1960s, when traces of water vapor were found and a tight upper limit was set on the amount of O2. The development of Fourier spectroscopy permitted an extension further into the infrared, where CO, HCl, and HF were observed. Radiometry, and especially polarimetry, eventually led to the identification of the substance of the cloud particles. After the near-infrared “windows” were identified, starting in 1983, spectroscopy of deeper parts of the atmosphere provided important further information. Visual studies, followed more recently by photography and infrared imaging, disclosed the 4-day rotation of the cloud tops and the 6-day period of a deeper region. Similar remarks apply to radio astronomical studies. Until the early 1990s, all ground-based radio work used radiation from the whole disk, but modest spatial resolution is beginning to be available by interferometry (the technique of combining the signals from several antennas). Many of the same techniques have been applied from flyby and orbiting spacecraft, but an important addition is the radio occultation experiment, which tracks the effect of the atmosphere on the telemetry carrier as the spacecraft disappears behind the atmosphere or reappears from behind it. On Venus, the regions observed in this way are the ionosphere and the neutral atmosphere from about 34 to 90 km. At greater depths, the refraction of the waves by the atmosphere is so great that the beam strikes the surface and never reappears. In addition to carrying several instruments for remote sensing, Pioneer Venus Orbiter (1978–1992) actually penetrated the upper atmosphere once per orbit, and took advantage of this by carrying a suite of instruments to make measurements in situ. Two mass spectrometers measured individual gases and positive ions; a Langmuir probe and a retarding potential analyzer measured electron and ion densities, temperatures, and velocities; and a fifth instrument measured plasma waves. Higher-energy ions and electrons, both near the planet and in the solarwind, were measured by a plasma analyzer, and important auxiliary information was provided by a magnetometer. In addition, the atmospheric drag on the spacecraft gave an excellent measure of the density as a function of height. A large number of probes have descended part or all the way through the atmosphere, and the Vega balloons carried out measurements in the middle of the cloud region. All of them have carried an “atmospheric structure” package measuring pressure, temperature, and acceleration; height was obtained on the early Venera probes by radar and on all probes by integration of the hydrostatic equation. Gas analyzers have increased in sophistication from the simple chemical cells on Venera 4 to mass spectrometers and gas chromatographs on later Soviet and U.S. missions. In some cases, however, there are suspicions that the composition was significantly altered in passage through the sampling in lets, especially below 40 km, where the temperature is high. A variety of instruments have measured the clouds and their optical properties. Radiometers observed the loss of solar energy through the atmosphere, and others have observed the thermal infrared fluxes. Winds were obtained by trackng the horizontal drifts of the probes as they descended, and the balloons as they floated. Venera 11–14 carried radio receivers to seek evidence of lightning activity. The fact that carbon dioxide is indeed the major gas was established by a simple chemical analyzer on the Venera 4 entry probe. The mole fraction was found to be about 97%. The next most abundant gas is nitrogen; though it is only 3.5% of the total, the absolute quantity is about three times that in the Earth’s atmosphere. The temperature profile is illustrated in Fig. 2, along with a sketch of the cloud layers. Many of the strange properties of the atmosphere can be traced to an extreme scarcity of water and its vapor and the total absence of liquid water. On Earth, carbon dioxide and sulfuric, hydrochloric, and hydrofluoric acids are all carried down by precipitation, a process that is absent in the hot, dry lower atmosphere of Venus. They all then react and are incorporated in geological deposits; the best estimates of the total amount of carbonate rocks in the Earth give a quantity of CO2 almost equal to that seen in the atmosphere of Venus. Free oxygen is undetectable at the Venus cloud tops; one molecule in ten million could have been seen. There is, of course, plenty of oxygen in carbon dioxide, and dissociation by sunlight liberates it in copious quantities. It is readily detected (as is CO) by spacecraft instruments orbiting through the upper atmosphere but is removed before it can reach the cloud level. Small quantities of O2 are also found below the clouds, probably liberated by the thermal decomposition of the cloud particles. All these lines of evidence point to the action of a strong mechanism in the middle atmosphere that converts O2 and CO back into CO2. The observed HCl molecules are the key; they too are broken apart by solar radiation, and the free chlorine atoms enter a catalytic cycle that does the job. This chemistry is closely coupled to the sulfur chemistry (see Section 4) that maintains the clouds. Carbon dioxide, aided by the other molecules listed in Table 1, makes the lower atmosphere opaque to thermal (infrared) radiation; it is this opacity that makes the extreme greenhouse effect possible. Only a few percent of the incident solar energy reaches the surface, but this is enough. Venus is a remarkable and extreme example of the large climatic effects that can be produced by seemingly small causes. One chlorine atom in two and a half million can completely eliminate free oxygen from the middle atmosphere, and ozone has no hope of surviving in significant quantities. The temperature increase caused by the green house effect is almost 500° C. The idea that the 30° seen on Earth could become 32° or 33° if its atmospheric content of CO2 should double seems entirely probable to experts on Venus’s atmosphere, and so does significant loss of ozone from release of chlorinated refrigerants. It thus seems that the obvious differences between Earth and Venus are all traceable to the differences in their endowments of water (vapor or liquid). Although origin and evolution are discussed in Section 6, a short preview is given here. It is plausible that both planets started out with similar quantities, but that the greater solar flux at Venus caused all its water to evaporate (a “runaway greenhouse”). Solar ultraviolet photons could then dissociate it into hydrogen (which escaped) and oxygen (which reacted with surface materials). Strong evidence in favor of this scenario is the extreme enhancement of heavy hydrogen (deuterium, or D), almost exactly 100 times more abundant relative to H than it is on Earth. Such a fractionation is expected because the escape of H is much easier than that of D.
Numerous absorption lines and bands allow inferences about the composition to levels all the way to the surface. One such spectrum is shown in Fig. 4. Each “window” allows the composition to be obtained at a different level; this is particularly important for water vapor, discussed in the next section. The measurement of carbonyl sulfide (COS) shown in Table 1 was obtained by this analysis. This gas has resisted all attempts to measure it from entry probes, even though it has long been expected to be present. Other gases include CO, HF, HCl, and light and heavy water vapor, all in good agreement with prior results. These results are also included in Table 1. It is convenient to regard the lower atmosphere as extending from the surface to about 65 km, the level of the visible cloud tops and also of the tropopause. This region has been measured in detail by many descent probes, with results in close agreement, and also by radio occultation. The temperature profile (see Fig. 2) is close to the adiabat, becoming noticeably less steep above the tropopause. As on Earth, the tropopause is a few kilometers lower at high latitudes than near the equator. The high surface temperature is maintained by the greenhouse effect, driven by the few percent of solar energy that reaches the surface. Converted to thermal infrared, this energy leaks out very slowly because of the opacity of the atmospheric gases at such long wavelengths. The molecules principally responsible are CO2, SO2, H2O, and perhaps others. Quantitative calculations have shown that the greenhouse mechanism is adequate, and that the observed solar and infrared net fluxes can be reproduced. These models treat the temperatures as globally uniform, so that they can be restricted to considering vertical heat transport only. The surface temperature is remarkably uniform with both latitude and longitude, largely because of a very long radiative time constant. A very slow atmospheric circulation is therefore adequate, but the details of how the nonuniform solar heating is converted to a uniform surface temperature are not understood. The ‘runaway greenhouse’ that may have operated early in the history of the planet is discussed in Section 6. Table 1 shows rather uncertain quantities of H2O, but there is no doubt that there is a major difference in the mole fractions below and above the clouds. This is almost certainly because the concentrated sulfuric acid of the cloud particles is a powerful drying agent (see Section 4.3). A summary of the many attempts to measure the abundance below the cloud is given in Fig. 5. Direct measurements have been made by several mass spectrometers and gas chromatographs, but the amounts are so small and the results so divergent that there remain many questions. Indirect measurements come from radiation fluxes, which are strongly affected by the opacity of water vapor. The four Pioneer Venus probes carried infrared net flux radiometers (points labeled “7” in Fig. 5), and Venera 11 and 12 carried an instrument working with weaker absorptions in the near infrared (dashed line labeled “2”). These measurements relate to the atmosphere far from the probe and are not affected by the difficulty, encountered by the gas chromato graph and mass spectrometers, of obtaining an undistorted sample of the gas. It is likely that many of the divergences are due to the extreme difficulty of measuring such small quantities of a reactive molecule at the high temperatures of the lower atmosphere, but some of the variations may reflect real effects of latitude or height. Particularly puzzling has been the indication from the mass spectrometer on the Pioneer Venus Large Probe that the mole fraction falls off by nearly a factor of 10 between 10 km altitude and the surface (Fig. 5, line “1”). It is likely that this result is incorrect; it is not supported by remote sensing of this region in the near-infrared windows. The ratio of heavy to light hydrogen (D/H) (150 times the value on Earth) was first measured on ions in the ionosphere and has been confirmed by the mass spectrometer just mentioned and by analysis of spectra taken from Earth in the near-infrared windows. In turn, the deuterium provides a valuable signature for distinguishing Venus water vapor in the mass spectrometer from any contaminants carried along from Earth. The likely enrichment process is discussed in Section 6. The middle atmosphere (stratosphere and mesosphere) extends from the tropopause at 65 km to the temperature minimum or mesopause at about 95 km (see Fig. 2). The upper atmosphere lies above this level. Here, temperatures can no longer be measured directly, but are inferred from the scale heights of various gases with use of the hydrostatic equation. On Earth and most other bodies, this region is called the thermosphere because temperatures in the outer layer, or exosphere, are as high as 1000 K. The temperature is much more modest on Venus; the exospheric temperature is no more than 350 K on the day side. The corresponding region on the night side is sometimes called a cryosphere (cold sphere) because its temperature is not far above 100 K.
The principal heat source for the thermosphere is the production of ions and electrons by far-ultraviolet solar radiation. The most abundant positive ions are O+ 2 , O+, and CO+ 2 . As part of these processes, CO2 is dissociated into CO and O, and N2 into N atoms. All of these ions, molecules, and atoms have been observed or directly inferred (Fig. 7). Some of the O+ions (with an equal number of electrons) flow around to the night side and help to maintain a weak ionosphere there. Venus lacks any detectable magnetic field, and the day side ionosphere is therefore impacted by the solar wind, a tenuous medium of ions (mostly H+) and electrons flowing from the Sun at about 400 km/s. Electrical currents are induced in the ionosphere, and they divert the solar wind flow around the planet. The boundary between the two media, called the ionopause, is typically at an altitude of a few hundred kilometers near the subsolar point, flaring out to perhaps 1000 km above the terminators and forming a long, tail-like cavity behind the planet. The thermospheric winds carry the photochemical products O, CO, and N from the day side to the night side, where they are almost as abundant as they are on the day side. However, as Fig. 7 illustrates, all gases fall off much more rapidly on the night side because of the low temperature. They descend into the middle atmosphere in a region perhaps 2000 km in diameter and generally centered near the equator at 2 a.m. local time. This region can be observed by the emission of airglow emitted during the recombina tion of N and O atoms into NO molecules, which then radiate in the ultraviolet, and O2 molecules, which radiate in the near infrared. The light gases hydrogen and helium are also carried along and accumulate over the convergent point of the flow; for these gases, the peak density is observed at about 4 a.m. These offsets are the principal evidence that this part of the atmosphere rotates with a 6-day period, a rotation that is superposed on the rapid day-to-night flow. Oxidation of the CO back to CO2 is much slower than the recombination of O and N atoms, but a very efficient process is required. This conclusion follows from Earth-based observations of a microwave (2.6-mm wavelength) absorption line of CO, from which a height distribution can be obtained from 80 to 110 km. It is found that the downward-flowing CO is substantially depleted on the night side below 95 km (as well as on the day side). The proposed solution involves reactions of chlorine atoms, as well as residual O atoms descending from the thermosphere. The chlorine acts as a catalyst, promoting reactions but not being consumed itself, and the reaction cycle works without the direct intervention of any solar photons other than the ones that produced the O atoms and CO molecules half a world away. The availability of Cl atoms is assured by the observed presence of HCl at the cloud tops (Table 1). On Earth, any HCl emitted into the atmosphere is rapidly dissolved in water drops and rained out. Chlorine atoms reach the stratosphere only as components of molecules, such as the artificial ones CCl4, CF2Cl2, and CFCl3 and the natural one CH3Cl, none of which dissolve in water. Once they have been mixed to regions above the ozone layer, they are dissociated by solar ultraviolet photons. Because liquid water is absent on Venus, the abundance of HCl is large to start with, and it is not kept away from the stratosphere. Here again the atoms are released by solar ultraviolet. The chlorine abundance is nearly a thousand times greater than that on Earth, and Venus is an example and a warning of what chlorine can do to an atmosphere. The middle atmosphere is also the seat of important chemistry involving sulfur, which is discussed in the next section. The clouds are perhaps the most distinctive feature of Venus. They do show subtle structure in the blue and near ultraviolet, illustrated in Fig. 1, which has been processed to bring out the detail and flattened to remove the limb darkening. Although the level shown in the figure is conventionally called the “cloud top,” it is not a discrete boundary at all. Similar cloud particles extend as a haze to much higher altitudes, at least 80 km; the “cloud top” is simply the level at which the optical depth reaches unity, and the range of visibility (the horizontal distance within which objects are still visible) is still several kilometers. Study of daily images, first from Earth and later from spacecraft, reveals that the cloud top region is rotating with a period of about 4 days, corresponding to an equatorial east–west wind speed of about 100 m/sec. The speed varies somewhat with latitude; in some years, but not all, the rotation is almost like that of a solid body. Although there are not nearly as many near-infrared images like Fig. 3, they show a longer period consistent with the idea that the sil houettes are of the lower cloud, where entry probes have measured wind speeds of 70 to 80 m/s. Several entry probes have made measurements of cloud scattering as they descended, but the most detailed results were obtained from Pioneer Venus and are shown in Fig. 8. Three regions (upper, middle, and lower) can be distinguished in the main cloud, and there is also a thin haze extending down to 30 km. Size distributions are shown in Fig. 9; it is these, more than the gross properties of Fig. 8, that distinguish the regions. In the upper cloud, the one that can be studied from Earth or from orbit, most particles (“Mode 1”) are about 1 μm in diameter and should really be considered a haze rather than a cloud; there are also larger (“Mode 2”) particles with diameters around 2μm. The same particles extend throughout the clouds, but the Mode 2 ones become somewhat larger in the middle and lower clouds, and a third population (“Mode 3”), greater than 6 μm in diameter, is also found. The existence of distinct modes is still not understood; the optical properties of all three are generally consistent with sulfuric acid, although there is some suspicion that the rare Mode 3 particles might be solid crystals. A cloud particle of diameter 1μm has a sedimentation velocity of 7.5 m/day at 60 km; this velocity varies as the square of the size. Though small, these velocities eventually carry the particles out of the cloud to lower altitudes and higher temperatures, where they will evaporate. At still lower heights the hydrated H2SO4 must decompose into H2O, SO2, and oxygen, all of which are (at least probably) much more abundant beneath the clouds than above them (Table 1). Atmospheric mixing carries these gases back upward. Nearly all the water vapor is absorbed by the cloud particles. Above the clouds, solar ultraviolet photons attack the SO2, starting the process that converts it back to H2SO4. An important intermediate is the reactive free radical SO, and probably some elemental sulfur is produced. Ultraviolet spectra (pertaining to the region above the clouds) reveal the presence of the small amounts of SO2 shown in Table 1, but much less than has been measured below the clouds. Sulfuric acid is perfectly colorless in the blue and near ultraviolet, and the yellow coloration that provides the contrasts of Fig. 1 must be caused by something else. Certainly the most likely thing is elemental sulfur, but yellow compounds are abundant in nature, and the identification remains tentative. The photochemical models do predict production of some sulfur, but it is a minor by-product, and the amount produced is uncertain. Probably the most likely alternative is ferric chloride, particularly for the Mode 3 particles in the lower cloud. Electromagnetic pulses have been observed by the entry probes Venera 11, 12, 13, and 14, by Pioneer Venus Orbiter, and by Galileo. For many years it seemed that the most likely source was lightning, and many workers are convinced of its reality. However, some searches for the corresponding optical flashes have been negative, except for one ambiguous interval from Venera 9. A recent study from the Earth does seem to have turned up a few optical events. A close flyby by the Cassini spacecraft saw no evidence whatever of any impulses with a sensitive instrument that, in a later Earth encounter, found them in abundance (Gurnett et al., 2001). This is strong evidence against the presence of lightning on Venus, at least at the time and in the region that was observed. The negative results may simply be because the flashes are too faint, but another concern is that conditions on Venus do not seem propitious for large-scale charge separation. On Earth, lightning is seen during intense precipitation and in volcanic explosions. In thunderstorms, large drops are efficient at carrying charge of one sign away from the region where it is produced, and the gravitational force is large enough to resist the strong electric fields. This is not the case for small particles. There does not seem to be enough cloud mass on Venus to generate large, precipitating particles, although they are difficult to detect and may have been missed. As for volcanic explosions, most of them are driven by steam; on Venus, water is very scarce, and the 93-bar surface pressure means that, other things being equal, any explosion is damped by a factor of 93 compared with Earth. In spite of these concerns, lightning remains one of the more plausible explanations for the radio bursts, but it is important to seek others. Careful tracking of entry probes, notably the four of Pioneer Venus, has shown that the entire atmosphere is superrotating, with a speed decreasing smoothly from the 100 m/s at the cloud top to near zero at 5–10 km. Winds in the meridional direction are much slower. Because the density increases by a large factor over this height range, the angular momentum is a maximum at 20 km. Small amounts of superrotation are observed in many atmospheres, especially thermospheres, but they are superposed on a rapid planetary rotation. (A familiar example is the midlatitude “prevailing westerlies” on the Earth.) In spite of a great deal of theoretical effort and a number of specific suggestions, there is still no accepted mechanism for the basic motion of the Venus atmosphere, nor is it given convincingly in any numerical general circulation model. What is needed is to convert the slow apparent motion of the Sun (relative to a fixed point on Venus) into a much more rapid motion of the atmosphere. There must also be a slow meridional (north–south) component, sometimes called a Hadley circulation, to transport heat from the equatorial to the polar regions. There are no direct measurements above the cloud tops, but deductions from temperature measurements suggest a slowing of the 100 m/s flow up to perhaps the 100-km level. At still greater heights the dominant flow is a rapid day–night one, first suggested on theoretical grounds and confirmed by the large observed temperature difference. But the flow is not quite symmetrical; maxima in the hydrogen and helium concentrations, and in several airglow phenomena, are systematically displaced from the expected midnight location toward morning. Possible explanations are a wind of around 65 m/s or a wave-induced drag force that is stronger at the morning side than the evening. An intermediate stage in the accretion was the formation of “planetesimals,” Moon-sized objects that merged to form the final planets. For the terrestrial planets (Mercury, Venus, Earth, Moon, and Mars), the number was probably about 500. These objects would not remain in near-circular orbits, and the ones in the inner solar system might end up as part of any of the terrestrial planets. One would therefore expect them to begin with similar atmospheric compositions, and indeed those of Venus and Earth have many interesting resemblances, as mentioned in Section 1. The smaller bodies appear to have lost all or most of their original gas (or never possessed much in the first place). 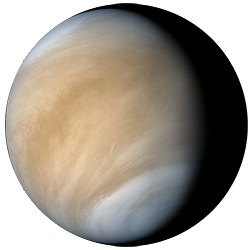 Many of the differences between the atmospheres of Earth and Venus can be traced to the near-total lack of water on Venus. These dry conditions have been attributed to the effects of a runaway greenhouse followed by massive escape of hydrogen. A runaway greenhouse might have occurred on Venus because it receives about twice as much solar energy as the Earth. If Venus started with a water inventory similar to that of the Earth, the enhanced heating would have evaporated additional water into the atmosphere. Because water vapor is an effective greenhouse agent, it would trap some of the thermal radiation emitted by the surface and deeper atmosphere, producing an enhanced greenhouse warming and raising the humidity still higher. This feed back may have continued until the oceans were gone and the atmosphere contained several hundred bars of steam. (This pressure would depend on the actual amount of water on primitive Venus.) Water vapor would probably be the major atmospheric constituent, extending to high altitudes where it would be efficiently dissociated into hydrogen and oxygen by ultraviolet sunlight. Rapid escape of hydrogen would ensue, accompanied by a much smaller escape of the heavier deuterium and oxygen. The oxygen would react with iron in the crust, and also with any hydrocarbons that might have been present. Although such a scenario is reasonable, it cannot be proved to have occurred. The enhanced D/H ratio certainly points in this general direction, but it could have been produced from a much smaller endowment of water (as little as 1%) than is in the Earth’s oceans. It used to be thought that Venus was a near twin of the Earth, perhaps a little warmer but perhaps able to sustain Earth-like life. It is still possible that the large divergences we now see could have arisen from different evolutionary paths; alternatively, the two planets may always have been very different. Two important minor gases in the atmosphere are likely to be variable in time: water vapor H2O and sulfur dioxide SO2. Each one is an infrared absorber that contributes to the greenhouse effect, and together they make up the material of the clouds, which also are involved with the greenhouse and which reflect some of the solar energy that would otherwise help heat the planet. Both are likely to be released from large-scale volcanic flows and eruptions, and water may also be brought in by the impact of a large comet. Water is dissociated by solar ultraviolet radiation, and the light H atoms escape from the top of the atmosphere while the oxygen, as well as the sulfur dioxide, react chemically with materials of the surface. These processes have been studied by Bullock and Grinspoon (2001) who find that the present situation is unstable and that after a billion years the clouds may disappear altogether. The predicted surface temperature may fall by about 50°C; although the planet will absorb more of the incoming solar energy, the effectiveness of the greenhouse will also be reduced. Rapid supply of gases from a volcanic event could raise the surface temperature by as much as 100°C for half a billion years, followed eventually by a return to conditions similar to present ones. A large number of other scenarios can be imagined, depending on the rate and timing of the events that might supply extra gases and the ratio of water to sulfur dioxide in each event. For example, the impact of a large comet would supply mostly water vapor, with relatively little sulfur dioxide. Volatiles on a planet are essentially the link between the atmosphere, the surface, and the interior, as well as an essential element in the habitability. A planet’s atmosphere forms primarily through the outgassing of volatiles from the interior. Outgassing results from the eruption and degassing of lava onto the surface. The rate of resurfacing is a function of the broad-scale geologic processes operating on a planet. These processes are driven by heat loss from the interior, which is primarily fueled by decay of radioactive elements. The interiors of the larger terrestrial planets are hot enough to convect, allowing hot material to rise and cold material to sink on timescales of millions of years. On Earth, convection is linked to surface processes via the process of plate tectonics. The presence of water in the interior of Earth acts to reduce the strength of the rock, which in turn allows the exterior shell of the Earth to be broken up into plates. As plates are pushed back into the interior, water is recycled back into the interior. Volatiles on Earth are also strongly affected by both the hydrosphere and the biosphere, both lacking on Venus. Although plate tectonics has controlled the evolution of Earth for at least 3 Ga, Venus has no trace of such a process. Plate tectonics creates a bimodal topography distribution on Earth, with high continents and low ocean basins, as well as an interconnected system of ridges and mountain belts at plate boundaries. No such features are seen on Venus. Most explanations of why Venus never developed plate tectonics point to the very low amounts of water currently present on Venus. The water in the atmosphere is equivalent to a surface layer less than 10 cm thick. The abundance of heavy hydrogen, or deuterium, in the atmosphere relative to the normal hydrogen population indicates that a huge amount of water was lost from Venus atmosphere early in it history. The dry atmosphere implies a dry interior for Venus, which is believed to make the outer shell on Venus too stiff to break into the plates observed on Earth. Although plate tectonics does not operate on Venus, it is clearly an active planet with a relatively young surface and a wealth of volcanic and tectonic features. The majority of the planet is covered with volcanic features such as shield volcanoes and lava plains directly analogous to Earth’s volcanic features. Many of the highland areas appear to form over mantle plumes, where hot material from the interior rises to the surface creating “hot spots” on the surface similar to Hawaii. In contrast, many of the tectonic features are unique to Venus. Examples include coronae, which are believed to result from small-scale plumes deforming the surface, and tessera, which are intensely deformed regions with multiple intersecting fracture sets. Spacecraft observation of Venus began in 1962 with a flyby by the Mariner 2 spacecraft. It observed Venus from 34,833 km, determining a 468°C (874°F) surface temperature and observing that Venus lacked a magnetic field. In 1967, Mariner 5 flew by Venus at an altitude of 4023 km, returning data on atmospheric composition and surface temperature. Also in 1967, the first probe entered the Venus atmosphere, when the Soviet Union’s Venera 4 returned data for 93 minutes. The Venera 5 and 6 probes followed in 1969, sending back more atmospheric measurements. Two more Venera probes followed in 1970 and 1972 making soft landings on the surface, with Venera 8 in 1972 transmitting data on surface temperature, pressure, and composition. The Venera 8 measurements were initially thought to be consistent with a granitic composition (see Section 5 for more discussion). The next U.S. mission to observe Venus was Mariner 10 in 1973, which was on its way to Mercury. Mariner 10 provided observations of the atmospheric circulation of Venus with both visible and ultraviolet wavelengths. In 1975, the Soviet Union landed two more probes on the surface of Venus, Venera 9 and 10, sending back panoramas of the surface for the first time (see Section 2) and making detailed geochemical measurements. These landers measured surface compositions similar to terrestrial basalts. The U.S. Pioneer Venus mission in 1978 consisted of an orbiter plus four atmospheric probes. The probes returned data on atmospheric circulation, composition, pressure, and temperature. The orbiter provided radar images of the surface, as well as a detailed global topographic map with a resolution of about 150 km. Major topographic regions such as Aphrodite Terra and Bell Regio were mapped, as were the 11 km high Maxwell Montes. The spacecraft was also used to map the gravity field of Venus. The Soviets followed with 4 more soft landers between 1978 and 1981, with three of the landers returning surface panoramas and surface compositional information. The last two soft landers (Venera 13 and 14) returned color panoramas (see Section 2) and drilled into the surface for samples. The next two Soviet missions were orbiters, Venera 15 and 16, and returned synthetic-aperture radar (SAR) images of the northern hemisphere of Venus in 1983, with resolutions of about 5–10 km. This rich data set revealed new types of features on the surface of Venus, including tessera terrain and coronae (discussed later). Vega 1 and 2 in 1984 carried balloon probes into the atmosphere and were the Soviet Union’s last missions to Venus. NASA’s Magellan mission to Venus was launched in 1989 from the space shuttle and arrived at Venus in August of 1990. It obtained SAR images and altimetry of the surface between 1990 and 1994, mapping over 98% of the surface. The spacecraft also obtained high-resolution gravity field measurements, especially after the orbit was lowered and circularized in 1993. The 120 m resolution SAR images and 1–10 km resolution altimetry data completely unveiled the surface of Venus and provided a global data set that could be used to test models of the interior and surface evolution of the planet. In 2005, the European Space Agency will launch its first mission to Venus: Venus Express. The mission focused on studying the composition and the circulation of the atmosphere of Venus. Venus orbits the Sun in a nearly circular path once every 224.7 Earth days. It is the second planet from the Sun, located between Mercury and Earth. The plane of Venus’ orbit is inclined to that of the Earth by 3.4°. Analysis of the obliquity of Venus reveals that it has a liquid core, similar to that of Earth. One day on Venus lasts 116.7 Earth days. The rotation of Venus on its axis is not only extremely slow but occurs in the opposite direction from all the other planets (retrograde rotation), so that the Sun rises in the west. When visible, Venus is the brightest planet in the night sky due to its size and proximity to both the Sun and to Earth. It’s easy visibility and the unusual pattern it makes in the night sky have given Venus a special place in astrology and made it an easy target for stargazers. Its proximity to the Sun means that it never rises very high in the sky, but it can often be seen as either the “evening star” in the west or the “morning star” in the east. The radius of Venus is 6052 km, only 5% less than the equatorial radius of the Earth, 6378 km. The average density of Venus is 5230 kg/m3, somewhat higher than Earth’s density. Thus, the acceleration of gravity at the surface is 8.87 m/s2, 90% of Earth’s. The radius of the Earth measured at the poles is approximately 21 km less than the radius at the equator. This difference is called the rotational bulge. The Earth’s spin accelerates the equator more than the pole, causing the pole to be flattened and the equator to bulge out. The very slow rotation of Venus means that no such flattening occurs, making it, on average, nearly spherical. The topography on Venus is dominated by plains, which cover at least 80% of the planet. There are also major high lands, including plateaus and topographic rises, as well as rifts and ridge belts that stand out from the background plains (see Fig. 1). Based on available data, the topography of Venus is unique in our solar system. Most of the smaller solid bodies, such as Mercury, Mars, and our Moon, as well as many satellites, bear the mark of numerous small craters and large impact basins, left from an earlier period in the history of our solar system when large impactors were common. As we will discuss in more detail later, the absence of impact basins and the small number of craters indicate that the surface of Venus is relatively young. On average, it is comparable to the age of the surface of the Earth. Venus and Earth both have a large topographic range, which results from the intense geologic activity that the two planets have experienced. However, the distribution of elevations on the two planets is very different (see Fig. 2). Earth’s topography is bimodal, while Venus’ topography is unimodal. The two peaks on Earth reflect the division between oceans and continents. Venus has no ocean and, as we will discuss later, arguably no continents. The topography on Venus differs from that on Earth in other significant ways. Most importantly, Venus lacks the interconnected system of narrow midocean ridges and long linear mountain belts that are the hallmark of plate tectonics on Earth (see Fig. 1). The absence of these features on Venus reflects fundamental differences in evolution between the two planets, and will be discussed in greater detail later. Four Soviet landers have returned views of the surface of Venus, Venera 9, 10, 13, and 14. These panoramas showed relatively similar sites: rocky surfaces with varying amounts of sediment (Fig. 3). Rocks at each site tend to be relatively angular, suggesting minimal erosion and possible ejection from an impact crater. All the sites are consistent with a volcanic origin, showing platy lava flows that have been covered to varying extents by sediments. The sediments may be of impact origin, produced by aeolian erosion or by chemical weathering. There are approximately 940 identified impact craters on the surface of Venus. They range in diameter from approximately 1.5 km to 268.7 km. The dense atmosphere on Venus causes impactors 1 km in diameter to break up before impacting the ground, reducing the number of craters 30 km in diameter. The shock waves that travel through these small objects can cause them to explode in a manner analogous to the Tunguska event on Earth. [See Planetary Impacts.] Atmospheric breakup and explosion, or other dynamic effects in the atmosphere, are believed to produce both radar-bright and radar-dark splotches on the surface (Fig. 4). The brightness of a radar image is primarily a function of how rough it is at the scale of the radar waveength (for the Magellan radar, 12.6 cm). The darker the image, the smoother the surface. Very rough areas appear very bright. Rough areas reflect the signal back to the spacecraft, while smooth areas allow the radar waves to bounce off in a direction away from the spacecraft. Approximately 400 of these “splotch” regions have been identified. These regions are believed to be either areas where fine-grained material has been scoured away (radar-bright areas) or regions where relatively fine-grain material has settled out of the atmosphere (smooth, radar-dark areas). Additionally, most impact craters have associated with them dark parabolas, which are also part of fine-grained ejecta that are deposited out of the atmosphere. In the absence of samples returned from planetary bodies, the only means of dating the surface is the analysis of the impact crater population. A great deal of work has been done on assessing the population of comets and asteroids available to impact the larger planetary bodies. [See Comet Populations and Cometary Dynamics; Main Belt Asteroids; and Planetary Impacts.] Dating of samples returned from the Moon has been used to tie the record of lunar craters to an absolute age. The estimated flux of impactors on the Moon must be extrapolated to other bodies in the solar system, which have different dynamical environments and thus different expected rates for impacts. This introduces a major uncertainty into the estimated age of a surface based on impact crater counts. Another major factor is the history of the surface itself. Modification of a surface by erosion, deposition, or tectonism can decrease the number of identifiable craters. Erosion can also remove deposits that had covered a surface. Additionally, secondary craters can form when large blocks of material are ejected during an impact. Impactors can break up during entry to the atmosphere, producing multiple smaller impacts rather than a single large impact. Despite these issues and the resulting uncertainties, estimated surface age is a very important clue in deciphering the geologic history of a planet. The estimated age of resurfacing on Venus is ∼750 million years (Ma). Given all the possible uncertainties in this age, estimates between 300 Ma and 1 Ga are permissible. This age is in contrast to ages of 3–4 Ga on average for Mars and the Moon. On Earth, new crust is continually forming along spreading centers in the oceanic crust. Continental crust can be old as 4 Ga, but craters are erased by water and wind erosion much more rapidly than on the other terrestrial planets. There are two highly intriguing characteristics of the Venus crater population. The first is that the distribution of craters cannot be distinguished from a random population. The second is that very few of the craters are modified by either volcanism or tectonism. Only ∼17% of the total population is either volcanically embayed and/or tectonized. An example of a crater that is both embayed and tectonized is Baranamtarra (Fig. 5). The low number of modified craters on the surface of Venus means that there is little record of the process or processes that reset the surface age to be less than 1 Ga. If volcanic flows had covered the surface of Venus at a uniform rate, there would be more partially buried craters. This observation of the crater population initially led to the hypothesis of global, catastrophic resurfacing. Subsequent detailed modeling of resurfacing showed that the population is consistent with a wide range of resurfacing models, allowing for different size areas to resurface at different rates. The small number of modified craters is most consistent with resurfacing occurring as small, ∼400 km diameter, regions. Howver, yet another variable is whether or not some craters with dark floors may in fact have been volcanically flooded. However, even if a larger number of craters have been modified by volcanism than initially estimated, the region covered by volcanism in these areas is small and still most consistent with resurfacing proceeding in small, local patches. We can estimate the rate of volcanic resurfacing if we assume that craters have been removed by burial under volcanic flows. Crudely, if one takes the characteristic resurfacing age to be 750 Ma and the average crater rim height to be 0.5 km, then the rate of volcanic production is ∼0.3 km3/year. Alternatively, if we consider the hypothesis that Venus resurfaced more quickly, in perhaps 50 Ma, the production rate is ∼4.6 km3/year. The relative volume of lava extruded on the surface is believed to be small compared to the volume intruded into the subsurface, perhaps 10% of the total. Thus, the total volume of melt produced might be a factor of 10 larger. For comparison, the estimated rate of volcanism for intrusive and extrusive volcanism on Earth is 20 km3/year. On planets with large numbers of craters, such as Mars, the surface age of local regions can be estimated from the crater populations. On Venus, some attempts have been made to determine the relative ages of either populations of specific types of geologic features or large areas on Venus. However, statistical analysis of this approach indicates that the very small number of craters on Venus makes attempts at dating particular landforms or even large areas not reliable. Although traditional crater-counting methods are not very useful, both the distribution of modified craters and the distribution of dark crater parabolas suggest some variation in surface age. In particular, the region with the highest density of volcanoes, coronae, and rifts appears to have a lower density of haloes and more modified craters, suggesting a younger age. Overall, the crater population on Venus indicates it is a comparatively active planet, completely resurfaced within the last 1 Ga, possibly with resurfacing on-going today. Volcanic resurfacing rates are likely on the same order of magnitude as those on Earth, but are a function of the poorly constrained rate of resurfacing, which could be either constant or variable. The distribution and modification of the craters implies that there are limited differences in the ages of large regions on Venus, unlike the dichotomy between the age of oceanic and continental crust on the Earth. The small number of modified impact craters leaves few clues as to the process(es) that obliterated the earliest surface of Venus. Below we discuss the implications of resurfacing for the overall geologic evolution of Venus. The energy that drives plate tectonics and other geologic processes is predominantly generated by the decay of radioactive elements. For the terrestrial planets, the primary contributors to radioactive decay are uranium (U), thorium (Th), and potassium (K). Based on estimates of the abundance of these elements on Earth and in chondrites [see Meteorites], radioactive decay cannot account for the total amount of energy. In addition, a significant amount, perhaps 25%, of the heat lost from the interior results from cooling of the planet over time, with some additional contribution from the heat of initial planetary accretion. The heat in the interior of the planet is predominantly transmitted to the surface via convection in the interior. Convection in the mantle brings hot, low-density material from the interior to the surface, or near the surface, allowing it to cool. Generally speaking, the larger a planet, the longer it will continue to lose energy and be geologically active. However, the details of the thermal evolution of a given body can be quite variable. Venus and Earth provide perhaps the quintessential example of variations in evolution. Most explanations of how Venus and Earth ended up on different geologic paths have to do with the history of volatiles. Volatiles, mainly in the form of water, play a key role in enabling plate tectonics on Earth. The presence of even a small amount of water in rock has a major effect on its strength and on the temperature at which it will melt. The water in the lithosphere is believed to be essential to making it weak enough to break into plates in response to the motions of convection in the interior. The asthenosphere is the upper part of the mantle, directly below the lithosphere, which has a lower viscosity than the rest of the mantle and acts to lubricate the motion of the plates at the surface of the Earth. The low viscosity of the asthenosphere may be a result of small amounts of melt. Melt would not be expected in the asthenosphere unless at least a small percentage of water is present. Thus, water appears to be an essential ingredient in the development of plate tectonics. Measurements made to date indicate that the surface and atmosphere of Venus have very little water. In terms of the strength of the crust, the extremely high surface temperatures might be expected to offset the lack of water, making the crust extremely weak. However, laboratory studies of rock strength at Venus temperatures have shown that dry basalt (see Section 5) is stronger than wet basalt at Earth temperatures. This extreme strength of the crust on Venus likely contributes to the lack of lithosphere scale breaks that are required to form plates. As we discuss later, there is also evidence suggesting that Venus has no asthenosphere. Recent studies have proposed that Venus exists in a “stagnant lid” convection mode rather than the “active lid” mode predicted for Earth. When convective stresses exceed the lithospheric strength, an active lid such as the terrestrial system of plate tectonics is predicted. On Earth, conditions such as weak, narrow fault zones, or the presence of a low viscosity asthenosphere, allow the convective stresses to exceed the lithospheric strength. On Venus, the present-day lithospheric strength is apparently too high to allow plates to develop. This model is consistent with the loss of volatiles as key to differences on Venus and Earth. Given the similarity in heat-producing elements and size between Earth and Venus and the absence of plate tectonics on Venus, how does Venus lose its heat? Venus must be convecting in its interior. As we will describe, although there is no evidence for plate tectonics, there is evidence that mantle plumes contribute to heat loss. On Earth, hot blobs of material form within the overall convecting pattern in the interior. These plumes form hot spots, such as the Hawaiian Island chain. The hot mantle material pushes upon the lithosphere, creating a broad topographic swell. The heat causes the lithosphere and crust to melt locally, thickening the crust and forming surface volcanoes. On Earth, the majority of the heat is lost where the upwelling mantle creates new crust at midocean rises, and the cold lithosphere is pushed back into the mantle at subduction zones. Hot spots account for < 10% of Earth’s heat loss. There are approximately 10 such hot spot features on Venus. These rises are Atla, Bell, Beta, Dione, W. Eistla, C. Eistla, E. Eistla, Imdr, Themis, and Laufey Regiones (Fig. 6). Those features believed to be active today, such as Atla, Beta, and Bell Regiones, have broad topographic swells, abundant volcanism, and strong, positive gravity signatures. Several rises also have rifts, such as Guor Linea at W. Eistla (Fig. 7). These features are characteristic of hot spots above a mantle plume. However, there are too few hot spot features on Venus (∼10 on Venus versus 10–30 on Earth) to account for a major portion of Venus’ heat budget. In addition to the large-scale (1000–2000 km diameter) hot spots on Venus, there are also smaller scale (mean diameter of ∼250 km) features called coronae (see Section 7). There are ∼515 of these features, which are unique to Venus. There is considerable evidence that many, perhaps all, of these features form above small-scale plumes. However, even if all coronae represented small-scale plumes, they would not be able to account for more than about one quarter of the interior heat loss on Venus. The relationship between the gravity and topography provides evidence that Venus does not have a low-viscosity asthenosphere. On Earth, a mantle plume must pass through the asthenosphere before reaching the lithosphere. (Note that there is some debate about the existence of an asthenospheric layer beneath the very thick continental lithosphere on Earth, but its existence below the oceanic lithosphere, where the majority of plumes are observed, is well accepted.) The plume tends to spread out in the relatively weak asthenospheric layer, resulting in a reduced amount of topographic uplift for a given plume size. Comparing the observed amount of uplift to the estimated size and depth of the low-density plume provides evidence for this behavior on Earth but not on Venus. On Venus, plumes strike the lithosphere directly, thus causing more uplift for a given plume size. The relationship between the gravity and the topography provide some insight into interior structure and convection. The magnitude of variations in the gravity field as compared to a given topographic feature is an indication of the interior structure that supports a given topographic feature. The strength of the lithosphere can support topography. Variations in density in the interior can also support topography. A mountain can be supported by a thick ‘root’ of low-density crust, analogous to an iceberg floating in denser water. Variations in the mantle temperature associated with convection can also support topography. The gravity field of Venus has been carefully studied to estimate the thickness of the strong, or elastic, part of the lithosphere, the thickness of the crust, and the location of low–density, relatively hot regions in the mantle. Clearly some highlands, such as tessera plateaus (see section VII), are compensated by crustal roots. Many other highlands appear to be compensated by mantle plumes. In addition to plumes, conduction through the lithosphere must contribute to the heat loss on Venus. The thinner the lithosphere, the more rapidly the planet loses heat. Estimates of the thickness of the lithosphere on Venus, derived from gravity and topography, are typically 100–200+ km. This is comparable to the lithospheric thickness on Earth, and is too large to account for the majority of Venus’ heat loss. There is growing evidence that the recycling of the lower lithosphere back into the mantle may help cool Venus, just as subduction helps cool the Earth. New models for corona formation show that at least some coronae may form above sites where the thickening, cold lithosphere becomes too dense and breaks off into the mantle. A new estimate of lithospheric thickness variations also suggests that the lower lithosphere may thicken and become unstable locally. Although possibly important, such a process is not going to be nearly as efficient a cooling mechanism as subduction. Volcanism, resulting from melting of the mantle and/or lithosphere and the rise of hot magma, can contribute to heat loss. As discussed earlier, Venus was completely resurfaced, most likely by volcanism within the last billion years. The cratering record shows that there has been less volcanism, on average, since resurfacing than the terrestrial average. Thus, volcanism cannot be a dominant mechanism of heat loss currently. Another constraint on interior processes is the absence (or extremely low level) of a magnetic field. The Mariner flyby missions measured no magnetic field, indicating that, if present, the field must be < 0.005 Gauss at the surface. Most models of interior dynamos indicate that a planet must be losing large amounts of heat from the planet’s metal core to provide enough energy for a dynamo. Some models have suggested that relatively rapid heat loss through plate tectonics is a good method of driving a dynamo. Thus, one possible scenario is that Venus had early plate tectonics and an active dynamo but eventually lost much of its water from the crust through volcanism to the atmosphere, where it was subsequently lost to space. This decrease in water increased the strength of the lithosphere to the point that tectonics ceased and the dynamo shut down. Heat is then lost primarily by conduction through the lithosphere, causing the mantle to heat up and increase the rate of volcanism, causing the planet to resurface. This idea is speculative, as there is no direct evidence for an early plate tectonic period. The unusual cratering record on Venus indicates that the first 3.5 Ga of geologic history has been somehow erased, with a lower rate of resurfacing occurring subsequently. In contrast, Mars, Mercury, and the Moon have surfaces that preserve the large impact basins from early bombardment and reflect a gradual loss of heat and decline in geologic activity. Some models have proposed that resurfacing on Venus occurs episodically. In one scenario, the lithosphere thickens and becomes denser due to both cooling and chemical phase transitions. The lithosphere is predicted to founder, or get mixed into the mantle, when it becomes gravitationally unstable. However, how the lithosphere actually breaks and initiates this process is unclear. In another scenario, the stagnant lid heat insulates the mantle, causing it to heat up to the point that widespread melting occurs, eventually erupting on the surface. Other models show that volcanism that is globally distributed and resurfaces small regions in each event can produce the observed distribution. High mantle temperatures could facilitate this kind of widespread volcanism. The similarity between Venus and Earth in terms of size and location in the solar system indicates that their bulk compositions should be comparable. The exact composition of the crust is related to the composition and temperature in the interior of the planet when the rock melts, as well how much of the original rock is melted. The typical rock type that forms on Earth when the interior melts and erupts is basalt. Thus, it is not surprising that geochemical measurements on the surface of Venus have a gross composition similar to terrestrial basalts, with some variation. On Earth, basalts make up the majority of the oceanic crust and are found in volcanic regions of continents. When processes such as subduction remelt basalts, the resulting rocks are enriched in silica (SiO2). Continental rocks are a result of billions of years of remelting of a basaltic crust driven by convective and plate tectonic processes. They are lower density than basalt due to the enrichment of silica relative to iron and magnesium. The presence of at least small amounts of water may be essential to the formation of such silica-rich rocks. Continents stand higher than the oceanic crust due to both their lower density and the greater thickness of continental crust. As we will discuss, there is limited evidence for silica-rich rock on Venus. The abundances of primary mineral-forming and radiogenic elements were measured by spectrometers on Veneralanders. Venera 8, 9, and 10 and Vega 1 and 2 landers measured the amounts of uranium (U), thorium (Th), and potassium (K) using a gamma ray spectrometer (Table 1). The Venera 13 and 14 landers measured these elements as well the major–element forming minerals (see Table 2). Due to the orbital dynamics of delivering probes to the surface of Venus in any given time period, Venera 8–14 landers are all located in a relatively small region on Venus within 270– 330°E and 15°S–30°N. This area includes the eastern flank of Beta Regio, a major hot spot, and the plains to the east of Beta and Pheobe Regiones. The Vega 1 and 2 landers, sent at an earlier time, are located near 170°E, 10°N and 180°E, 10°S to the west of Atla Regio. The silica content and the relative abundances of iron and magnesium for rocks at the Venera lander sites (Table 1) are characteristic of basalt. Although some variations in composition do exist, when the overall abundance of elements is considered in the context of minerals that occurstably together, all the rock compositions are consistent with a basaltic composition. Early analysis of the relatively high value of U, Th, and K at Venera 8 suggested that this location was composed of a more silica-rich rock, possibly even granite. However, subsequent analyses have discounted this idea and concluded that the Venera 8 site is mostly basaltic, although it has more silica than other lander sites. Variations in elemental abundance do suggest that some real differences exist. The bulk composition of Venus can be extrapolated from these measures. Within the uncertainties, the composition is similar to that of Earth. Similarly available data on Fe/Mg and Fe/Mn suggest that the core composition is similar to Earth’s. Some variation may occur after the rock forms. For example, the amount of Al, Ti, Ca, or Si may change through chemical weathering or metamorphism when the rock experiences changes in pressure and/or temperature. The initial chemical measurements of the surface have provided invaluable constraints on the surface composition. However, the overall number and geographic diversity of sites remains limited. The precision of the measurements that were possible with instrumentation built in the 1970s is very low compared with measurements possible today. The uncertainties in the measurements mean that numerous questions such as the size of the core (which is constrained by the ratios of Fe/Mn/Mg) and the amount of crustal recycling cannot be addressed. In fact, the uncertainties in the Venusian measurements are so large that they encompass the entire range of composition for basalts on Earth, Mars, the Moon, and meteorites. In contrast, basalts from the Moon and Mars (as represented in meteorites) have a distinct chemical signature from Earth. [See Meteorites.] These variations represent key differences in the formation and evolution of these bodies, such as the formation of a magma ocean on the Moon. In addition to direct measurements of the composition, morphology can be used as a very crude indication of composition. For example, lavas with a basaltic composition tend to be very fluid, forming long, narrow flows and broad, low volcanoes. As the silica content increases, the viscosity of the lava increases. The thicknesses of flows increase, their lengths decrease, and the slopes of volcanoes formed increases. Terrestrial examples are Mauna Loa in Hawaii (basaltic) and Mt. St. Helens in Washington (more silica-rich). On Venus, the morphology of flows is generally consistent with low-viscosity, basaltic compositions. There are some features that appear to represent much thicker, shorter flows (see description of “pancakes” in Section 6). However, these morphologies cannot be considered diagnostic of composition as factors such as the volume and rate of material erupting, the atmospheric pressure during eruption, and the amount of gas in the lava also shape the morphology of the flow. Although weathering of the surface by wind is relatively mild on Venus as compared to Earth, the environment for chemical weathering is extremely harsh. In addition to the searing temperature and high pressure, the atmosphere contains highly corrosive and chemically active gases such as SO2 (sulfuric acid), CO, OCS, HCl (hydrochloric acid) and CO2. A variety of minerals form in laboratory experiments that simulate Venus conditions, such as wollastonite, anhydrite, and hematite, but no landers have measured actual minerals. Measurement of the specific minerals present and their abundances is highly desirable as they provide in sight into the nature of the chemical interaction between the surface and the atmosphere. This information is a critical piece of understanding the larger problem of how Venus arrived at the hellish climate that now exists. One of the key questions is how much CO2 is trapped as carbonates on the surface of Venus. Most of the CO2 found on Earth is trapped as carbonates via biological processes, specifically the formation and accumulation of seashells. This process is an important element of the overall balance that makes Earth habitable. Available information from surface composition and laboratory experiments suggests that significant amounts of carbonates could be present on the surface of Venus, perhaps up to 10%. If so, this would mean that CO2 in surface rocks is an important part of determining the atmospheric pressure and composition. Another key question is how atmospheric SO2 interacts with the surface. On Earth, most of the SO2 is dissolved in the oceans. Rates of chemical reactions involving SO2 are known for the conditions in the atmosphere of Venus and predict that the SO2 in the present-day sulfuric acid clouds on Venus should react with other chemicals and disappear over time. This analysis indicates that SO2 should disappear from the atmosphere within 2 Ma. The fact that sulfuric acid clouds are present today implies that new sulfur gases have been added to the atmosphere with this time by volcanic eruptions. Other important measurements for understanding the surface–atmosphere interactions are the oxidation state of iron minerals and minerals that react with hydrogen chloride (HCl) or hydrogen fluoride. With the exception of Jupiter’s moon Io, Venus is the most volcanic world in the solar system. Volcanic features of a broad range in morphology cover the surface, from sheet like expanses of lava flows to volcanoes shaped like pancakes and ticks, as illustrated later. The high surface temperature and pressure on Venus make explosive volcanism less likely, though some possible deposits produced by explosive volcanism have been mapped. The extreme conditions on Venus also result in volcanoes that tend to be taller and broader than those on Earth or Mars. Magellan data illustrated that volcanic features do not occur in chains or specific patterns, indicating the lack of plate tectonics on Venus. The plains or low-lying regions on Venus are covered by sheet and digitate deposits that are interpreted to be volcanic in origin (Fig. 8). These extensive deposits are likely to be flood basalts, formed in similar ways to the Columbia River basalts or the Deccan Traps on Earth. In some plains regions, the surface is clearly built up of multiple, superposed lava flow deposits, while other regions are more featureless. Lava flows have varying brightness in the Magellan SAR images. Most lava flows are of intermediate brightness. Comparisons to radar images of lava flows in Hawaii indicate that the venusian flows have similar roughness, though some flows on Venus are unusually smooth. The plains are also covered with abundant small (< 5 km across) shield and cone-shaped volcanoes (e.g. Fig. 9). Thousands of these volcanoes have been mapped, and they may contribute as much as 15% of the plains volcanic deposits. Other flows in the plains may have originated at fissures, which were then obscured by later eruptions. Timing of the plains flows is a subject of debate, with some advocating that the plains formed relatively synchronously across Venus in a single resurfacing event. Others argue that the data support a slower, nonsynchronous formation for the plains. Unfortunately, the impact crater population can be interpreted to support either hypothesis, and it will take future mission data to constrain plains formation on Venus. Large volcanoes on Venus (those with diameters >100 km) are found at topographic rises, along rift zones, and concentrated in the region bounded by Beta Regio, Atla Regio, and Themis Regiones. Over 100 large volcanoes have been identified. Large volcanoes have average heights of about 1.5 km and aprons of lava flows that extend hundreds of kilometers from their summits. Maat Mons, the largest volcano on Venus is about 8.5 km high and 400 km across (Fig. 10). In comparison, Mauna Loa, the largest volcano on Earth, is about 9 km high and 100 km across. Detailed studies of individual large volcanoes have revealed their complex histories. Many volcanoes show evidence of multiple eruptions from their summits as well as sites on their flanks. Some large volcanoes have calderas at their summits similar to volcanoes on Earth and Mars, formed by collapse of the underlying magma chamber. Others have radially fractured summits, with the radial fractures interpreted as the surface expression of subsurface dikes. These dike sets provide evidence that many large volcanoes have undergone multiple episodes of intrusion and extrusion. At the smaller end of the scale, volcanoes 5–50 km across are also abundant on the surface of Venus (Fig. 11). Many of the volcanoes resemble their terrestrial counterparts, with summit calderas and radiating digitate flows. Venus also has several types of volcanic features that differ from those on Earth and other planets. The steep-sided or pancake domes are flat-topped, with steep sides (Fig. 12), similar to the flat topped Inyo domes in California that are formed by silicic lavas. The Venus domes may have a different composition though, as they are much larger and have smooth rather than blocky surfaces in comparison to the terrestrial domes. Other unusual volcanoes on Venus resemble ticks, or bottle caps. These small domes have scalloped margins and are interpreted to be steep-sided domes whose margins have collapsed. The Magellan radar also imaged channels, a few kilometers wide and hundreds of kilometers long. The channels are found many places within the plains, tend to be very sinuous, and in places show evidence of levees and flow breakouts. The channels have formed by lava of some unusual composition, so fluid that it behaved like water and able to flow long distances without cooling. A number of compositions have been proposed, including carbonate or sulfur-rich lavas and ultramafic silicate melts. Others have suggested that the channels were formed by erosion of the surface by lava, similar to lunar rilles on the Moon. [See The Moon.] Some of the channels extend for long distances, allowing them to be used as a time marker, as it can be assumed that the channel formed over a relatively short period of time. For example, the channel may superpose one feature, but be overlain or cut by another. Also, a few channels now trend uphill, indicating that the surface deformed after they formed. Are volcanoes on Venus still active? There are over 1500 active volcanoes on Earth, but Venus probably has fewer active volcanoes. Gravity studies indicate that a number of volcanoes may be dynamically supported, and thus still active. A decline in SO2 over time observed by the Pioneer Venus spacecraft has been interpreted to possibly indicate a relatively recent eruption. In addition, volcanism within the last 10–50 Ma is supported by climate models. Future missions to Venus monitoring the atmosphere may be able to detect a future venusian eruption. For the larger terrestrial planets, Venus, Earth, and Mars, mantle convection is the primary driving force for tectonic processes. On Mars, most tectonic structures are associated with either the gigantic Tharsis rise or the global dichotomy. [See Mars Surface and Interior.] The global dichotomy divides the smoother northern lowlands from the heavily cratered southern highlands. On Earth, plate tectonics is clearly dominant. Tectonic features on Venus are highly variable and enigmatic. Tessera terrains are unique to Venus and are defined as having multiple intersecting deformation directions. One possible factor in creating these highly deformed regions is that Venus experiences very little surface erosion. In contrast, most continental regions have experienced multiple episodes of deformation, but surface structures are often eroded between events, leaving evidence of only the most recent occurrence. Many of the tectonic features on Venus are continuous for thousands of kilometers and likely reflect underlying mantle processes including upwelling, downwelling, and horizontal flow. We describe next the characteristics and likely origins of the key types of tectonic features on Venus. Tessera terrains are highly deformed and thus stand out as very bright in radar images (Fig. 13). They are made up of both extensional and compressional deformational features. Each set of lineations may represent a separate deformation event, or two sets may form simultaneously if shear deformation is involved. In some cases, the sequence of events can be determined, but more often it is ambiguous. Tesserae occur both as isolated fragments embayed by later plains material and in major plateaus. There are 6 major crustal plateaus: Alpha, Ovda, Pheobe, Thetis, and Tellus Regiones plus Ishtar Terra. Figure 14 shows Alpha Regio, one of the smaller highland plateaus. Western Ovda Regio may be a relaxed crustal plateau. These plateaus are 1000–3000 km in diameter and 0.5–4 km higher than the surrounding plains. Their gravity signature indicates that they are supported by crustal roots rather than active mantle processes. Ishtar Terra is unique among the highland plateaus. It is the largest of the crustal plateaus, and is surrounded by significant mountain belts on 3 sides, with large areas of tesserae occurring on their exterior flanks. They are Venus’ only real mountain belts. Lakshmi Planum makes up the interior of Ishtar Terra. This smooth plateau is elevated 3–4 km above the surrounding plains and is covered by volcanic flows. The Maxwell Montes to the east of Lakshmi Planum contain the highest point on Venus, at approximately 11 km above the mean planetary radius (see Fig. 6). Although other crustal plateaus tend to have relatively flat interiors and rims of higher topography, no other crustal plateau is as extreme as Ishtar Terra in terms of its diameter, elevation, and circumferential deformation features. Crustal plateaus have been proposed to form over mantle upwellings and over mantle downwellings. In the mantle upwelling scenario, a plume creates a crustal plateau though decompression melting above the plume head, analogously to plateaus formed on the terrestrial seafloor. Deformation occurs as the topography viscously relaxes. The alternative model forms the plateaus above a cold, sinking mantle downwelling. On Earth, both subduction zones and local sites of downwelling form below cold mountain roots. Venusian crustal plateaus are proposed to form as a downwelling causes sinking of the lower lithosphere and accumulation and compression of the crust at the surface. The mechanism for forming small, local regions of tessera is not clear. In many cases, these regions are embayed and thus appear to be old and possibly inactive. There are few clues as to original processes that cause deformation. One possibility is that these areas represent sections of tessera plateaus that were once elevated but have topographically relaxed. If plateaus formed in an earlier, hotter time period, relaxation may have proceeded more rapidly, allowing for complete relaxation of plateaus. The semicircular rim of Western Ovda Terra could be the remnant of a relaxed plateau. Alternatively, small tessera terrains may be a result of an entirely different type of tectonic event, such as ridge belt formation. Chasmata (chasma means canyon) are regions of extensional deformation, as indicated by their locally low topography and graben or graben-like morphology. There are 5 major chasmata on Venus that extend for thousands of kilometers and are several kilometers deep: Parga, Hecate (see Fig. 15), Dali/Diana, Devana, and Ganis Chasmata. The fracture zones in these regions are typically ∼200 km wide, with topographic troughs that are generally narrower, with widths of ∼50–80 km. There are 7 smaller chasmata, with lengths of hundreds of kilometers and proportionately narrower fracture belts and troughs. Several of the chasmata occur on the flanks of hot spot rises and may be a result of topographic uplift above a plume. The majority of other chasmata form synchronously with coronae, as discussed earlier. Although chasmata are not required for coronae to form, nor vise versa, it is clear that the presence of one increases the likelihood of the other. Both extension and upwelling plumes can thin the lithosphere, which may focus additional extension and upwelling in an area. Fracture belts appear similar to minor chasmata but are less intensely fractured, implying lesser amounts of extension. A curious feature of fracture belts is that they are topographically broad swells rather than topographic lows. The positive relief suggests that they went through a compressional stage, and that the fractures may be due to topographic uplift rather than regional extension. Coronae are large (>100 km across) circular features surrounded by concentric ridges and fractures (Fig. 16). Over 500 coronae have been identified on Venus; the largest one is Artemis Corona at 2500 km across. Coronae often have volcanoes in their interiors, and many are surrounded by extensive lava flows. Coronae tend to be raised at least 1 km above the surrounding plains, but others are depressions, rimmed depressions or rimmed plateaus. Most coronae are located along rift or chasmata systems, although some are at topographic rises, and others occur in the plains away from other features. Coronae are thought to form over thermal plumes or rising hot blobs, smaller in scale and probably rising from shallower depths than the plumes that form topographic rises. The wide range in corona topographic shapes indicates that coronae evolution also involves delamination or sinking of lithospheric material in its later stages. Studies of the gravity signatures of some large coronae indicate that many coronae are likely to be isostatically compensated, and thus probably inactive. The fact that we do not see coronae on Earth may be due to the lack of an asthenosphere on Venus. Ridge belts occur in a variety of morphologies and are distributed around the planet. Based on the morphology of individual fractures and the long, narrow topographic highs that comprise individual ridges, ridge belts are interpreted to be a result of compressional stresses (see Fig. 17). Individual ridges are typically less than 0.5 km high, 10–20 km wide, and 100–200 km long with a spacing of ∼25 km. The two largest concentrations of ridge belts occur in Atalanta/ Vinmara Planitiae and Lavinia Plantia. The belts in Atalanta/ Vinmara Planitiae are roughly an order of magnitude larger than those elsewhere. Belts in Livinia are unusual in that they have extensional fractures roughly parallel to compressional features within the same belt, possibly due to topographic uplift along the ridge. Larger belts are believed to result from mantle downwelling, similarly to the proposed downwelling origin for crustal plateaus, but with lower strain. Smaller belts may be associated with more local scale tectonics. Wrinkle ridges are extremely common features on Venus and are also interpreted as simple compressional folds and or faults but are much narrower (∼1 km or less in width) than ridges. They have positive relief, based on the fact that lava flows can be seen to pond against some wrinkle ridges, but that relief is too small to be seen in Magellan altimetry. Most ridges occur in evenly spaced set, 20–40 km apart. These sets of wrinkle ridges can be local in nature, associated with a corona for example, but more commonly they cover thousands of kilometers. These larger sets are likely to be gravitational spreading of high topography into lower regions and can be seen to form rings around some large topographic features (see Fig. 4). Other sets cannot be clearly associated with topographic highs. One hypothesis is that these features result from thermal contraction due to climate-change driven atmospheric temperature changes. In some regions, there are two sets of wrinkle ridges, although one set is usually better developed. A wide range of long, narrow, approximately straight fractures occur in the plains. Some fractures are wide enough to be resolved as graben, but most are too narrow (less than 0.5 km) to be resolved as more than fractures. Most are interpreted as extensional fractures because they parallel resolvable graben and because of their shape. Some are clearly associated with local features such as volcanoes or corona and are probably due to extension above dikes. In some locations, there are either single sets or intersecting grids of fractures that cover hundreds of kilometers (Fig. 18). They are very regularly spaced, with separations of 1–2.5 km. The narrow spacing suggests that a thin layer is involved in the deformation. It is not obvious how a uniform stress can be transmitted to such a thin layer over such a broad regions. Shear deformation be required to produce grids of intersecting lineations. Another type of extensional feature observed on Venus is polygons, which are found in over 200 locations on Venus. These features are analogous to mud cracks in that they form in a uniform, extensional stress field. However, they form not as water is lost but instead when rock cools and contracts. The typical diameter is∼2 km, but some are up to 25 km across. Some areas have multiple scales of deformation. Again, some of these features can be associated with local events such as volcanoes, but others cover very broad regions and do not have an obvious origin. Polygons are most commonly associated with small volcanic edifices, and frequently appear to form synchronously (Fig. 9). Some may form by actual cooling of lava flows. Such basaltic columns are common on Earth, but the scale of the features found on Venus is orders of magnitude larger, implying that the flow thickness on Venus would probably to too large to be plausible. Another mechanism, as proposed for wrinkle ridges, is the possible heating and cooling of the upper crust due to climate change. Venus provides a unique window in to the evolution of terrestrial planets. It is essentially identical to Earth in size and bulk composition, yet its geologic history is entirely different. Venus’ level of geologic activity over the last billion years is comparable to that of Earth and exhibits many of the same geologic processes. The convecting interior drives geologic activity at the surface, creating a dozen major highlands. These highlands include hot spots, which form above mantle plumes, and the more enigmatic and intensely deformed highland plateaus. The majority of the surface is composed of vast volcanic plains along with nearly ubiquitous tectonic features. There are tens of thousands of volcanic features from small-scale (hundreds of meters) flows, vents, and shields, to hundreds of large-scale (>100 km) shield volcanoes that blanket the surface. The pervasive volcanism may have buried the earliest, heavily cratered surfaces, or they may have been destroyed through tectonic processes. Tectonic features range in scale from pervasive linear fractures and polygons at the limit of resolution to highland plateaus composed of tessera terrain 1000–2000 km in diameter. Despite the similarities between Venus and Earth, Earth is the only body in our solar system that developed the system of plate tectonics that has so shaped the geologic and environmental evolution our planet. The atmosphere of Venus lost nearly all of its water early in its evolution. The loss appears to have affected the interior as well, causing the lithosphere to be too strong to break into the plates observed on Earth, and the asthenosphere to be too strong to facilitate rapid horizontal plate motion. This same loss of water has contributed to the dominance of CO2 in the atmosphere and the resulting greenhouse effect that created the scorching surface conditions. Why Venus lost its water is not understood, but as with Mars, the absence of a magnetic field exposes the atmosphere to erosion by solar wind. In turn, a planet must be losing heat rapidly enough to drive the formation of a magnetic dynamo. The interior volatile content affects the processes through which planets lose heat and appears to be the key to whether or not plate-tectonics develops. Was Venus originally on the same evolutionary path as Earth? What was the pivotal event or process that sent Venus down an alternate path to the hellish, unin habitable planet we observe today? We can begin to address these questions, thus better understanding the evolution of our own planet, through future missions to understand the coupled evolution of the atmosphere, surface, and interior.